Established in 1995 Vista specialises in uPVC and composite door supply for trade. 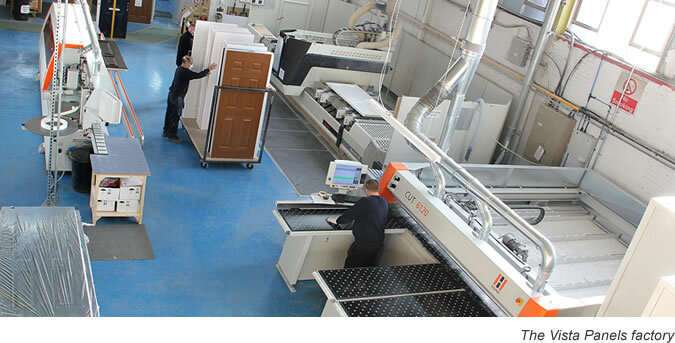 We supply uPVC panels and GRP (Glass Reinforced Plastic) doors to leading fabricators across the UK and Europe. We export to France and have sent products to Iceland, Denmark, Hungary and Barbados. uPVC and standard GRP composite doors have a lead time of five working days, and GRP composites with top and sidelights and Heritage spray coloured composites have a lead time of ten working days. Our products are manufactured in our state of the art, 50,000 sq ft factory in Merseyside. Investing in new machinery has helped us continually improve product performance and, maintain consistent levels of quality, and provide fabricators and installers with even more key selling points to consumers in the domestic market. Recent investments include a new edgebanding machine, which applies a uPVC edgeband to our composite doors to improve thermal efficiency. We’ve also invested in a beam saw and a new colour coating facility. This facility means you can now offer your customers high performance composite doors in any colour including our Heritage range featuring Duck Egg Blue, Chartwell Green, Cream and Moondust Grey. And because all colouring is done in house you benefit from shorter lead times too.